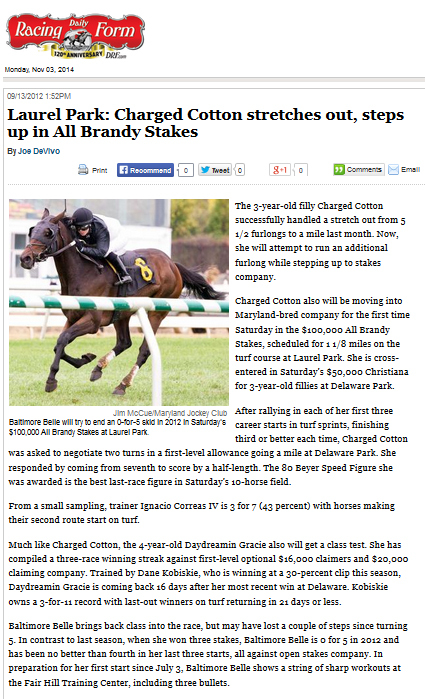 The 3-year-old filly Charged Cotton successfully handled a stretch out from 5 1/2 furlongs to a mile last month. Now, she will attempt to run an additional furlong while stepping up to stakes company. Charged Cotton also will be moving into Maryland-bred company for the first time Saturday in the $100,000 All Brandy Stakes, scheduled for 1 1/8 miles on the turf course at Laurel Park. She is cross-entered in Saturday’s $50,000 Christiana for 3-year-old fillies at Delaware Park. After rallying in each of her first three career starts in turf sprints, finishing third or better each time, Charged Cotton was asked to negotiate two turns in a first-level allowance going a mile at Delaware Park. She responded by coming from seventh to score by a half-length. The 80 Beyer Speed Figure she was awarded is the best last-race figure in Saturday’s 10-horse field. From a small sampling, trainer Ignacio Correas IV is 3 for 7 (43 percent) with horses making their second route start on turf. Much like Charged Cotton, the 4-year-old Daydreamin Gracie also will get a class test. She has compiled a three-race winning streak against first-level optional $16,000 claimers and $20,000 claiming company. Trained by Dane Kobiskie, who is winning at a 30-percent clip this season, Daydreamin Gracie is coming back 16 days after her most recent win at Delaware. Kobiskie owns a 3-for-11 record with last-out winners on turf returning in 21 days or less. Baltimore Belle brings back class into the race, but may have lost a couple of steps since turning 5. In contrast to last season, when she won three stakes, Baltimore Belle is 0 for 5 in 2012 and has been no better than fourth in her last three starts, all against open stakes company. In preparation for her first start since July 3, Baltimore Belle shows a string of sharp workouts at the Fair Hill Training Center, including three bullets.